Stud for playfield plastic posts- #6-32: #6 machine thread on top and bottom, 32-threads-per-inch pitch. For use on most games using #6-32 screws and accompanying plastic posts. 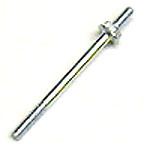 Measures 1-9/16 inches from bottom of nut to screw tip, 2 inches overall length. Replaces Bally/Williams # 02-9899. #6-32 is the smaller size (smaller diameter) of the two sizes of this part used on games over the years. Some later-model Bally/Williams games (late 1980s and up) may use the larger #8-32 size part, which is discontinued.